Perfectly located within a fifteen kilometre radius of the South of Durban’s largest industrial area, The Weaver Centre is conveniently located in the Southgate Business Park, a mere three minutes away from the Galleria Shopping Mall. Parking is safe, spacious and on the same level as the conference centre. Arrive at the Weaver Centre and be dramatically surprised at the ambience, surroundings and atmosphere. 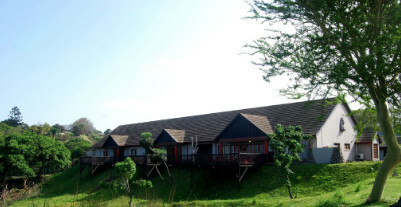 You will forgive yourself for thinking that you are overlooking a private game farm in wildest Africa. The entire venue whilst relaxed and elegant, meets corporate standards and any blue chip organisation can host their corporate event here with complete peace of mind. Weaver Conference Centre offers a diverse venue that caters not only for weddings, but other functions such as birthdays, anniversaries, staff parties as well as corporate functions and conferences. This upmarket, fully air-conditioned venue set in a bush lodge theme has four separate venues with three conference room facilities off set with sun decks and boardroom facilities, is paraplegic friendly and has a fully licensed bar and sit down restaurant. Our largest room, The Weaver Room can seat two hundred guests and has a dance floor and stage and is therefore perfect for weddings or parties. The Red Bishop Room can accommodate a maximum of forty guests and has high ceilings and a private foyer suitable for training and conferences. The Leopard Room is well suited for board meetings or private family dinners as it is exclusive and private and our Bird’s Nest restaurant and bar has a capacity of fifty people and you can use the restaurant to host your event as well. We invite you to experience our warm hospitality and indulge in the best beef curry available.